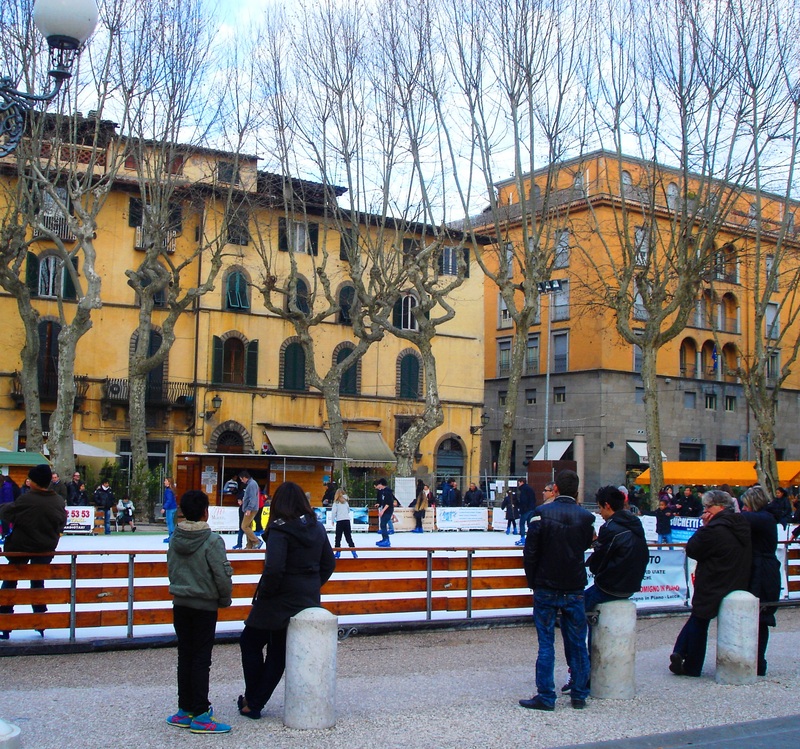 Skating in Piazza Napoleone in Lucca. This seems a popular activity today, even though it is a lovely balmy day. The snows pre-Christmas have disappeared and we have had some lovely almost warm sunny days. Seeing ice skating in a piazza that I usually associate with hot sunny weather seems strange. Among the joys of living in Italy are the new friendships you make along the way, as well as the local people you meet in everyday life. For instance when you need wood to burn, you have to find the local man who cuts, seasons, stores and delivers your wood. We needed more wood and the local man is a seventy year old who delivered only 10 quintale (10 hundred kilos) of wood because he knew that would be enough for now when we had asked for 20, and also charged us one euro less per quintale because we were now villagers and local friends. The Signor who runs a store in Pescia that sells everything you can think of in 5 storeys of an ancient store house . We usually buy our bombole (gas bottles) there but he sells beds, matteresses and other furniture, all sorts of ironmongery, tools, paint. He also sells stufas – wood burning stoves that are the staple of heating equipment in rural Italy. We tried an open fire in our new sitting room but alas – too smokey and drafty. So we opened our wallets a little bit more and found Signor Fattorini had two whole rooms full of these stufas of all sizes and types. A wonder house of iron and steel. We selected what we needed, a lovely tall black stove, and it was deliverd in days with the peices of flue that we needed to go up the chimney and in 15 minutes we were off and burning. We love our stufa and at last our house in Tuscany feels much more like a home. We have had lots of guests in and out over the last few weeks of Christmas and the New Year and it has been a pleasure to welcome them with a lovely warm cosy room in the winter of Tuscany. 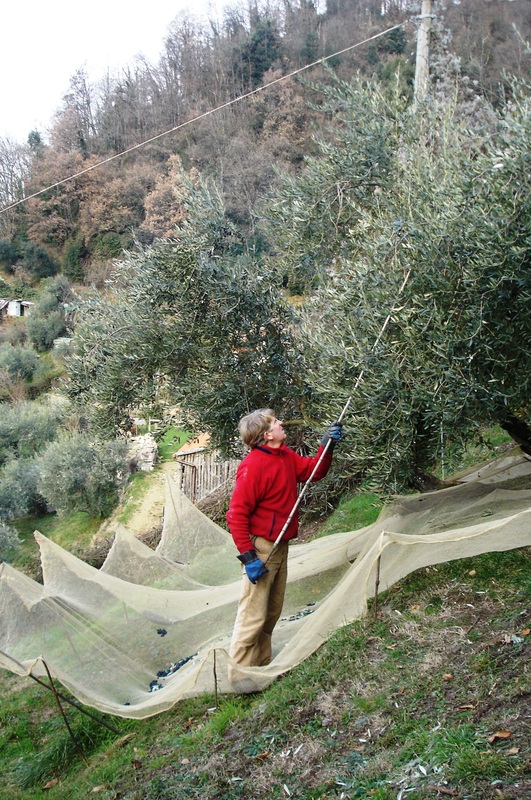 What with rain and snow, plus all the other work we have had to do we have finally harvested our few olive trees. We however are not the only ones in the area to have harvested later this time around. The type of olive trees that we have and that are also prevalent in the region are the ‘Lecce’ type. They are black olives as you can see and make a very fine extra virgin oil and do not look much like the versions you might buy to eat in any supermarket. These are a very beautiful purple blue in reality and look fantastic when gathered together in a basket like this. Our kind neighbour has helped us out by lending to us her nets to help harvest the trees. These nets are then laid under the tree. As we only have 6 trees at present we were able to use the traditional method of getting the fruit from the trees by using two long sticks to shake the branches. The fruit then, very courteously, drops into the nets below. Those who have many more trees than us use a mechanical devise that looks like a vibrating toasting fork . Thus with a few helping hands 60 trees can be done in a couple of days. That is enough for about 60 – 90 litres of oil.